Asmat drums are made in exactly the same way that the mythological figure Fumer-ipits is said to have made the drum that brought the Asmat people to life. 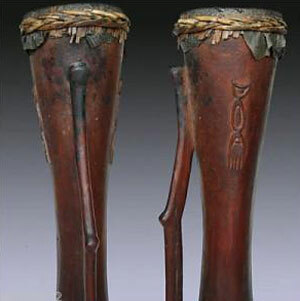 The drums are carved from a single piece of wood and the handle is decorated with head hunting symbols and covered with the skin of a monitor lizard, attached with an adhesive made from blood and lime. Indeed, the mythological Fumer-ipits was thus not only the first wood carver but also the first drummer. The hourglass shaped drums take a long time to make and require constant attention as the drum may split during the drying process. Each drum is carved from a solid log being specially selected for its soft centre, which can be easily removed with a hard palm wood stick. A lot of water is needed for this task which is usually performed by the banks of a river preferably at high tide so that the wood chips wash away. Once the centre hole is made, the hourglass shape is obtained by placing hot embers on the wood to burn it slowly. The charred canter is then scraped out afterwards; the exterior is shaped out leaving the curved handles. Holding the drum close to a fire and allowing the skin to shrink to the correct tension tune a drum. Because of the high humidity, a drum skin loses tension rapidly and needs to be retunaed every twenty to thirty minutes. The picture of the drum is determined by its length and diameter. Each drum can produce only a single tone and so usually a number of drums and drummers are used.